plants for color all year, and year after year! Your grandparents grew them, divided them, and shared them over the back fence. They conjure up visions of English cottage gardens, long lush borders with spikes of bright flowers behind low creeping mounds of blooms, artistically combined for a season-long series of blooms from one type after another. The mainstay of the flower garden 100 years ago, their popularity declined with the postwar advent of suburbs, where beds of compact, brightly colored annuals became fashionable. Perennials became collector's items offered by specialists. But sales of flowering perennial plants have been increasing every year at nurseries for over a decade. The reasons are easy to find. Perennials bloom year after year, multiply freely, and generally require very little care other than regular watering and occasional grooming. Perennials can be grown from seed (though they're unlikely to bloom the first year), can be divided from existing plants, purchased in 6-packs or 4" pots, or in bloom in #1 containers. Many mail-order companies specialize in soft perennials, and nurseries are carrying more and more kinds. There are more than 34,000 varieties of Daylilies alone! Annual bedding plants often give more dramatic color for the months when they bloom, but they need to be replanted each season. Many people get the terms annual and perennial backwards. 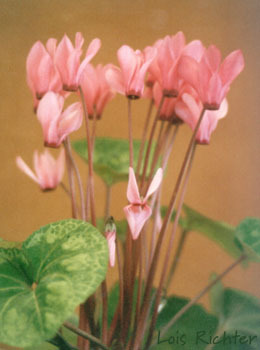 are plants which flower the first year, and then die at the end of the growing season. Summer annuals grow in the warm season and are killed by frost: Impatiens and Marigolds are good examples. Some of our summer annuals such as fibrous Begonias will survive the winter and act as short-lived perennials. Winter annuals grow through the winter and are killed by hot weather: Pansies and Snapdragons are the best-known. Biennials are a unique category; they grow the first year, then bloom and die the second year. Sweet William, Canterbury bells, Hollyhocks, and most Foxgloves are biennials. are plants which grow for several to many years and flower at the same time each year: Chrysanthemums, Lavenders, and bulbs such as Daffodils are all familiar perennials. There are two basic types. Woody perennials such as Lavender and Rosemary make small shrubs. 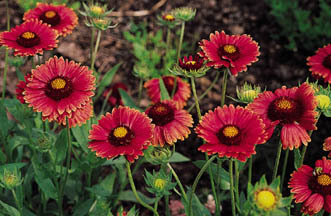 Herbaceous (or soft) perennials such as mums bloom on stems that grow from the ground each year. While they may have foliage during the winter, it is usually close to the ground. Some have no foliage at all in the winter, which is important to know when you're designing a perennial garden. The most important difference is that woody perennials should not be pruned severely -- preferably never more than 20 to 25% of the plant's height at once. Herbaceous perennials can be pruned to the ground or to the low tufts of foliage that they have through the winter. This can be done in fall or spring, depending on when the plants bloom. One fall, when my wife was 8 1/2 months pregnant with our first child, she felt that some things really needed to get done before the baby was born (you've all heard of "nesting" -- why else would you need to clean the garage before having a baby? It's not like the kid's going to be spending a lot of time out there!). In her advanced state, she took electric hedge shears to our long perennial border. When I got home, it looked as if she'd taken a riding mower to it! But I just raked out the foliage and broadcast some fertilizer, serene in the knowledge that we were rejuvenating our plants, and the border did look much tidier. When planning a mixed group of perennials, it's important to avoid a jumbled or cluttered look. An easy way to do that is select one or two colors to predominate, and cooler colors (blue, purple, light pink) and white flowers always make the border look less raucous. Yellow is useful in the shade, though, as the cooler colors tend to be less visible. Remember that the first year is a period of establishment, and the effect you're creating may not be apparent. Throw in some easy to grow annuals (Cosmos, Sweet alyssum) or ground covers (Verbena) to fill in the first season. And remember, perennials are very easy to move and rearrange in the fall or early spring. Changed your mind about the way things look? Just redo it! Remember to choose some background shrubs or woody perennials that look good all year, especially in the winter when many of the softer perennials are dormant. Plant these in the background and at strategic locations in the border. Even the pedestrian Juniper, especially 'Old Gold', provides nice contrast in the winter. Other good choices are Rosemary, with blue winter flowers, Lavenders for their grey foliage, and Coleonema 'Sunset Gold', a low-growing version of pink Breath-of-heaven. Plants with grassy or iris-like leaves provide good contrast to the softer perennials (designers like to call these "accent plants"). Ornamental grasses such as the Grey fescue, bronze fountain grass, Daylilies, or even plain old Bearded irises can provide vertical contrast. Perennials that send up flower spikes such as Penstemon or Russian sage can be used effectively behind cascading plants that have foliage or flower colors that contrast. Flowering shrubs, including shrub and miniature roses, are very useful mixed with perennials and require very little care compared to traditional roses. Garden art, stones, small trees, gazing globes, and bird baths can provide points of interest. Repeating some plants through the border makes it look more orderly, and the way some perennials increase this is a simple thing to accomplish! Low ground covers or a border of annual flowers in front can pull the whole design together; particularly useful are Cerastium (Snow-in-summer), Sweet alyssum, or Lobelia. A full season of bloom! 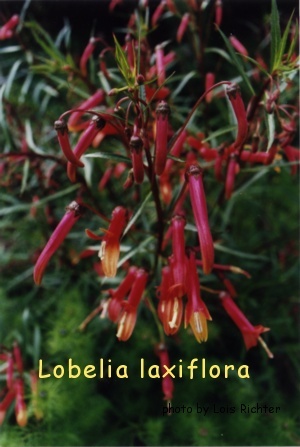 Choose plants that bloom at different times through the season. In our climate we really can have flowering perennials year 'round, and by supplementing with annuals we can have colorful borders even in the dog days of summer and the depth of winter. By the way, those are the two more challenging times to get color in the landscape. August to early September, when the spring flowers have petered out and the summer heat at its peak: try Echinacea (yes, the same herb that's supposed to help your immune system), Gloriosa daisy, Shasta daisy, Japanese anemone, dwarf Plumbago, Asters. December to late January, when it's either raining or our famous valley fog makes the days dismal, dark, and cold: try Cyclamen, Euryops, and Hellebore. Plant some perennials -- your grandmother and eventually your grandkids will appreciate them!